The much-hyped new trailer for Guardians of the Galaxy Vol. 2 starring Chris Pratt, and Zoe Saldana. In theaters May 5. (1) SF AND THE PARTY. In New Scientist Lavie Tidhar explains why “In China, this is science fiction’s golden age”. In the 1980s, science fiction once again fell foul of the ruling party, as a new “Anti-Spiritual Pollution Campaign” emerged as a backlash to Deng Xiaoping’s modernisation and liberalisation policies. Deng’s opponents in the party railed against Western “bourgeois imports” of all kinds, and with sci-fi seeming to fall firmly in that category, it was all but wiped out for a time. The genre’s recovery was partly led by the emergence of Science Fiction World magazine in Chengdu, and its energetic editor, Yang Xiao, herself the daughter of a prominent party member. Having such influential backing allowed Science Fiction World to bring together many young writers for an “appropriate” reason. By the end of the century, Chinese sci-fi entered its own golden age. Although the authorities still raised the issue of literary “appropriateness”, the old restrictions had gone. One prominent contemporary sci-fi author is Han Song, a journalist at the state news agency Xinhua. Many of his works are only published outside the mainland due to their political themes, but Han is still widely recognised at home. His fiction can be dark and melancholy, envisioning, for instance, a spacefarer building tombstones to fellow astronauts, or the Beijing subway system being turned into a graveyard in which future explorers, arriving back on Earth, find themselves trapped on a fast-moving train. Along with Liu Cixin and Wang Jinkang, he is considered one of the “Three Generals” of Chinese sci-fi. (2) SHARING THE MUSIC. The LA experimental hip-hop group Clipping, reported here the other day as seeking a Hugo nomination for their sci-fi oriented album Splendor & Misery, has raised the ante. Now they are giving away free copies to Hugo voters. Their goal is to be nominated in the Best Dramatic Presentation (Short Form) category. They are distributing free download codes via Twitter, but voters are allowed to share. I figure it wouldn’t be fair to post it online – Clipping could have done that themselves – but i you’re a Hugo voter who’s not on Twitter and want to get the DL code, email me a mikeglyer (at) cs (dot) com and I will send it to you. (4) GUNN THEME. 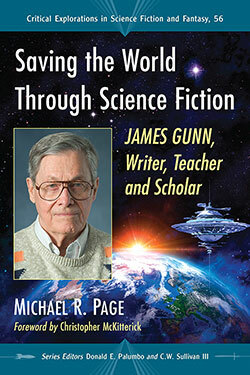 A book about 2013 Worldcon guest of honor, Saving the World Through Science Fiction: James Gunn, Writer, Teacher and Scholar by Michael R. Page, has just been published by Macfarland. One of the major figures in science fiction for more than sixty years, James Gunn has been instrumental in making the genre one of the most vibrant and engaging areas of literary scholarship. His genre history Alternate Worlds and his The Road to Science Fiction anthologies introduced countless readers to science fiction. He founded the Gunn Center for the Study of Science Fiction in 1982. But Gunn has also been one of the genre’s leading writers. His classic novels Star Bridge (with Jack Williamson), The Joy Makers, The Immortals and The Listeners helped shape the field. Now in his nineties, he remains a prominent voice. His forthcoming novel is Transformation. Drawing on materials from Gunn’s archives and personal interviews with him, this study is the first to examine the life, career and writing of this science fiction grandmaster. (5) CHUCK TINGLE, VOID WHERE EXHIBITED. I tell you, they can’t give this man a Nobel Prize too soon. The only delay will be thinking up a category for it. Hugo nominated author Dr. Chuck Tingle is well known for his thoughts on love and romance, but there is another side to this revered modern philosopher that is needed now more than ever. Dispensed within this non-fiction volume is everything that you need to know about The Void, a terrifying place outside reality that is constantly overflowing with cosmic horror. Will you know what to do when The Void starts leaking into your timeline? Within Dr. Chuck Tingle’s Guide To The Void you will find multiple strategies for battling The Void, as well as survival techniques that could save your life, should you ever find yourself lost within The Void’s infinite grasp of existential dread. Most creatures of The Void are covered in detail, including Void Crabs, worms, Ted Cobbler, and The Man With No Eyes And Wieners For Hair. Also included within this guidebook is important information on Void related subjects like reverse twins, Truckman, the lake, and the call of the lonesome train. For anyone interested in the darker planes that lie just outside of The Tingleverse, this book is for you. Warning: This book includes mind-bending depictions of existential cosmic horror. Read responsibly, and stop immediately if you begin to suffer any symptoms of Void Madness. (6) MEMORIES. Connie Willis added two new posts to her blog this month. He was one of my best friends, and I’d rather have talked to him than anybody. He was smart, witty, and full of fascinating stories about horror movies and urban legends and weird news articles. At our last dinner a mere two weeks ago at Cosine, an SF convention in Colorado Springs, he had all sorts of wry and insightful comments about Saturday Night Live, the movie Hidden Figures, and Donald Trump. But he was not just a friend. He was also a mentor to me before that term even became popular. He taught me how to write, how to critique, how to find my way around the complex maze of the science fiction world without getting in trouble. He encouraged me to go to conventions, introduced me to everyone he knew (and he knew everybody from Jack Williamson to Harlan Ellison to George R.R. Martin) and got me onto panels. He even got me my first Hugo nomination by relentlessly talking me up to everybody. Unfortunately, I’d only made it through part of the D’s when I discovered science fiction and I abandoned Francie’s plan to read everything with a spaceship-and-atom symbol on the sign. February 28, 1965 – Dr. Terror’s House of Horrors premieres in North America. (8) REFERENCE BOOKS. People are still buzzing about Sunday night’s Oscar mixup, especially those hoping to leverage social media attention by mentioning it. But librarians? (9) ARMAGEDDON ACTOR. Heritage Auctions is auctioning celebrities’ collections in Dallas on March 18. One of the items of genre interest was owned by Bruce Willis. 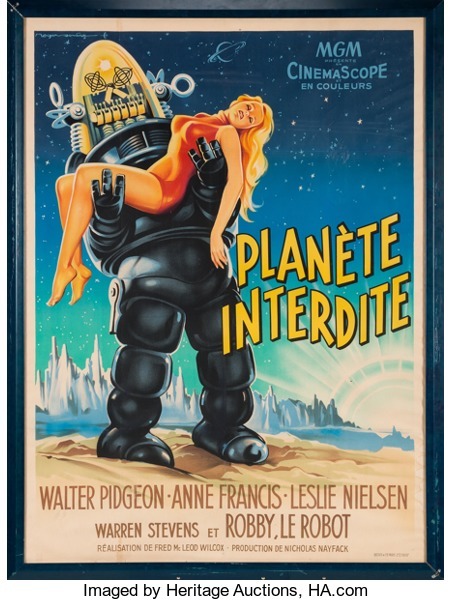 Among his top offerings is a French Movie Poster from Forbidden Planet (est. $3,000). This large-format poster in French “grande” size (47 by 63 inches), from the 1956 Metro-Goldwyn film, features one of the most iconic images from the science fiction genre: Robbie the Robot carrying an unconscious beauty. All text, including the film’s title, is written in French. The poster includes a letter of authenticity signed by Willis. (10) NEVER SEEN. 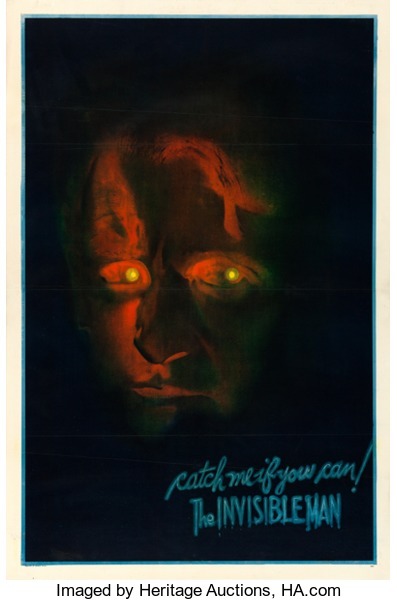 The following week at the Vintage Movie Posters Signature Auction a rare Invisible Man poster will bring top dollar. 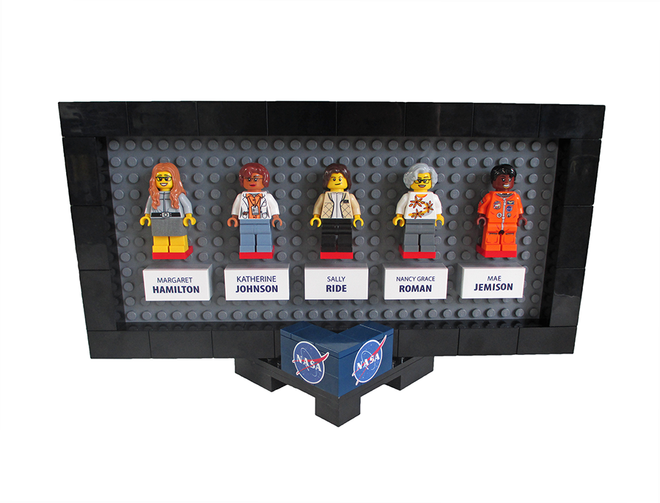 (11) WOMEN OF LEGO The proposed “Women of NASA” LEGO set covered in last July in the Pixel Scroll has been approved for production the toy company announced today. We’re still working out the final product design, pricing and availably for the Women of NASA set, so check back on LEGO Ideas in late 2017 or early 2018 for more details. (12) PROMO. Kameron Hurley sent supporters custom dust jackets forThe Stars Are Legion, released earlier this month. She also has done a blog tour to promote the book. The posts are listed here. (13) MAINTAINING HIS IMAGE. French campaigner uses tech to be in two places at once: “Holograms, mistrust and ‘fake news’ in France’s election” from the BBC. The communications coup of the French presidential election so far goes to far-left candidate Jean-Luc Melenchon who, with a flick of his fingers, appeared at two simultaneous rallies 350 miles apart and created more internet buzz than he could have imagined. The technology required was nothing new – he does not have the money – but the performance was done with panache. Walking on stage in Lyon, Mr Melenchon materialised at exactly the same moment in hologram form before supporters in Paris. He then made a speech to both audiences for 90 minutes. He likes to talk. Afterwards Mr Melenchon claimed 60,000 live followers of the event on Facebook and YouTube. Millions more in France and around the world read about the exploit afterwards and clicked online for a taster. In publicity terms it was magisterial. (14) SHELF SPACE RACE. History of an object important to many fans. The Billy bookcase is perhaps the archetypal Ikea product. It was dreamed up in 1978 by an Ikea designer called Gillis Lundgren who sketched it on the back of a napkin, worried that he would forget it. Now there are 60-odd million in the world, nearly one for every 100 people – not bad for a humble bookcase. (15) THE ADULTS IN THE ROOM. Were Chuck Wendig and John Scalzi channeling their inner McCalmont and Glyer when they had this Twitter exchange? (16) TERRIBLE PUN. Wish I had thought of it first…. A werewolf has apparently mated with the Loch Ness Monster. Please retweet to raise a Were Ness. (17) A SPACE TAIL. Spark, a teenage monkey and his friends, Chunk and Vix, are on a mission to regain Planet Bana – a kingdom overtaken by the evil overlord Zhong. Voices by Jessica Biel, Susan Sarandon, and Patrick Stewart. In theatres April 17. The “One Book-One City” Reading Project of the South Pasadena Public Library and the Friends of the South Pasadena Public Library will focus on Ray Bradbury’s Fahrenheit 451. On Thursday, March 2 at 5:00 p.m., the Kickoff for the Reading Project will take place at the South Pasadena Fire Station. It will present Micah the Magician from the World Famous Magic Castle in Hollywood. Special guests will also offer some Ray Bradbury reminiscences. 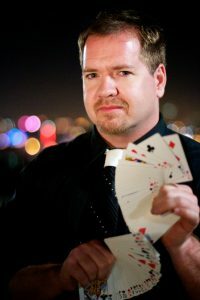 Micah will be performing a magic show for all ages in honor of Bradbury who wanted to be a magician while growing up – before he decided on a writing career. It will be presented at the Fire Station because firemen play central roles in the Fahrenheit 451 plot. Bradbury wrote Fahrenheit 451 on a rental typewriter in the basement of UCLA’s Lawrence Clark Powell Library, where he had taken refuge from a small house filled with the distractions of two young children. Ballantine editor Stanley Kauffman, later the longtime film critic for The New Republic magazine, flew out to Los Angeles to go over the manuscript with Bradbury, plying the sweet-toothed perfectionist author with copious doses of ice cream. The book came out to glorious reviews. To this day it sells at least 50,000 copies a year and has become a touchstone around the world for readers and writers living under repressive regimes. 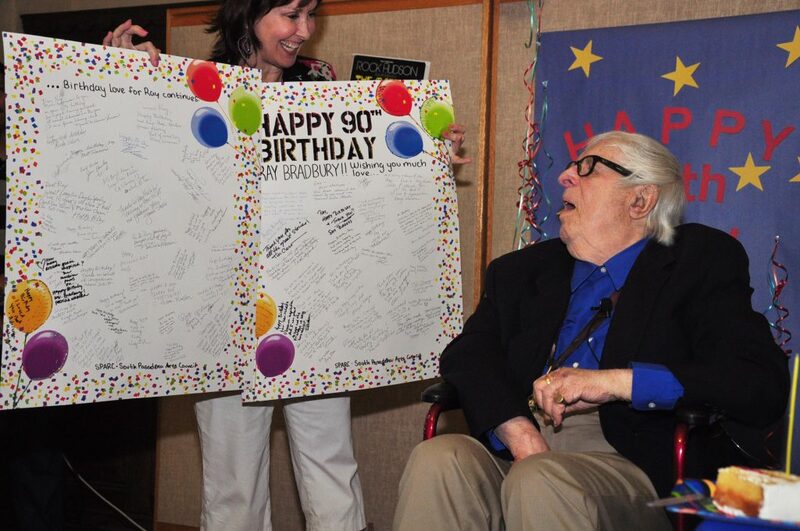 Lissa Reynolds of the Fremont Center Theater helps Ray Bradbury read his 90th birthday card. Ray Bradbury’s plays were performed at South Pasadena’s Fremont Centre Theatre for many years by his own Ray Bradbury’s Pandemonium Theatre Company. He also appeared for two Author Nights for the South Pasadena Public Library, including for his 90th Birthday Celebration which attracted hundreds to the Library Community Room and Library Park. At that event, he exhorted his fans to “Do what you love and love what you do!” Ray had done just that, until his death at age 91. The South Pasadena Fire Station is located at 817 Mound Avenue. Doors will open at 4:30 p.m. Strange Horizons this week publishes the first installment of a new interview series, 100 African Writers of SFF. The series will run through 2017 and 2018, exploring the recent explosion of speculative fiction across the African continent. Written by the award-winning writer and academic, Geoff Ryman, the project is the result of extensive research and travel to almost a dozen African countries so far, including Kenya, Malawi, Nigeria, South Africa, and Uganda. The series will feature interviews with writers such as the Commonwealth Fiction Prize-shortlisted author and filmmaker Dilman Dila; futurist and editor Ayodele Arigbabu; Jennifer Nansubuga Makumbi, whose novel Kintu won the Kwani Manuscript Prize, and will be published in the U.S. this May; and many more. Tracing both the established tradition of African SFF writing, and providing a window into a thriving and diverse contemporary literary scene (as evidenced by such projects as the Jalada Collective’s 2015 AfroFutures issue, Omenana magazine, and the African Speculative Fiction Society), 100 African Writers of SFF aims to provide a bridge between the featured writers and a broader SF and literary readership. 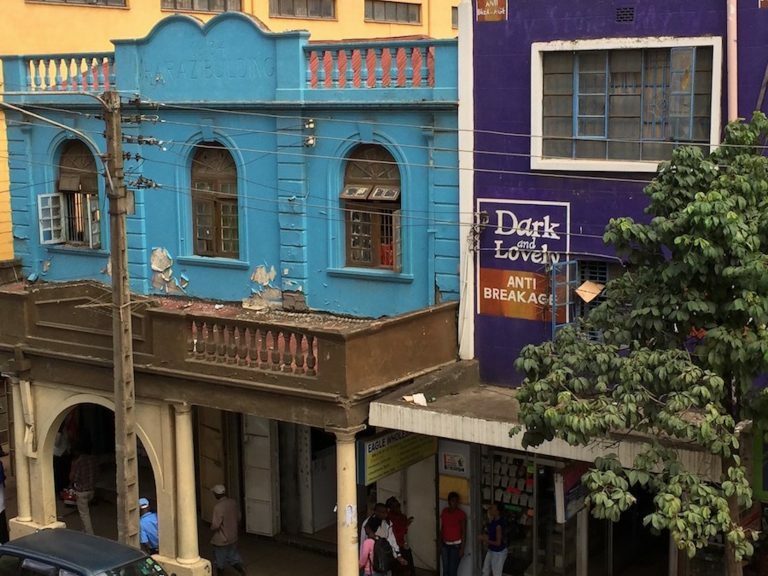 This week, Strange Horizons will be publishing the first three chapters of 100 African Writers of SFF, covering Nairobi (February 27), diaspora writers in the UK (March 1), and Cape Town (March 3). Further chapters will be published approximately every 2 months. 100 African Writers of SFF is supported and made possible by a grant from the Leverhulme Trust. Parts One and Two were previously published by Tor.com in 2016. Strange Horizons is a not-for-profit, volunteer-staffed magazine of and about speculative fiction, founded in 2000 with the aim of highlighting new voices and perspectives in speculative fiction and related nonfiction. 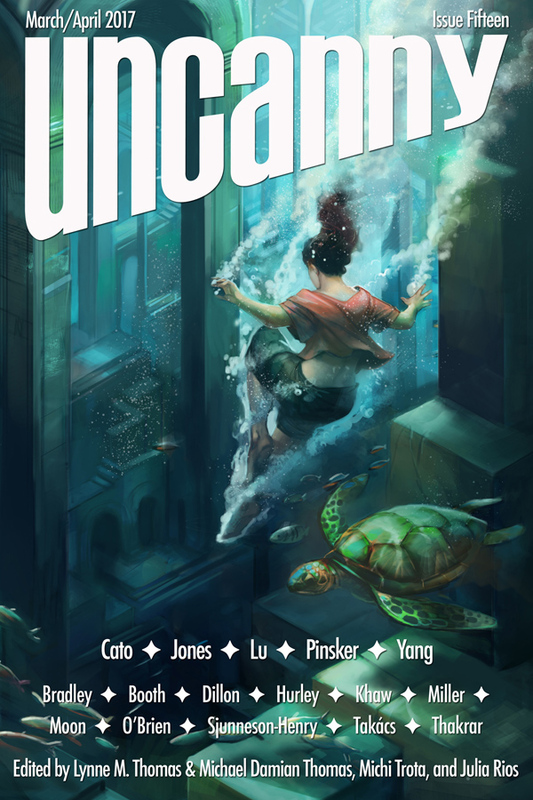 The fifteenth issue of the 2016 Hugo Award-winning Uncanny Magazine will be available on March 7. 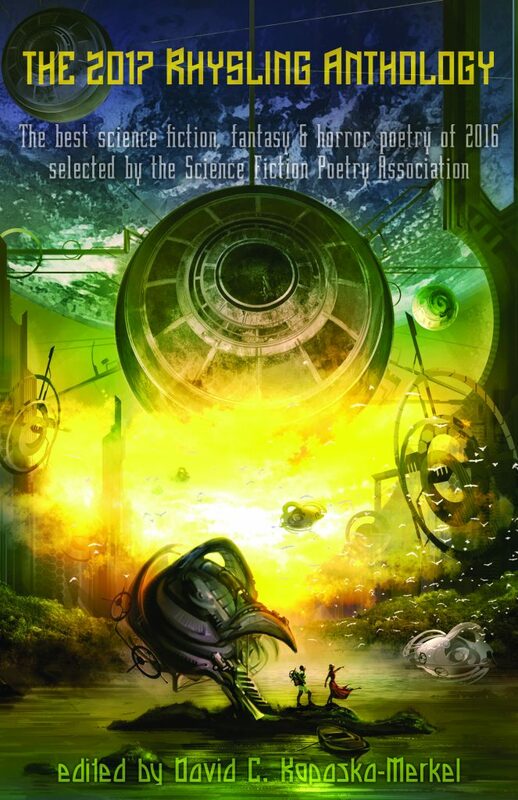 Hugo Award-winning Publishers/Editors-in-Chief Lynne M. Thomas and Michael Damian Thomas are proud to present the fifteenth issue of their 2016 Hugo Award-winning online science fiction and fantasy magazine, featuring passionate SF/F fiction and poetry, gorgeous prose, provocative nonfiction, and a deep investment in the diverse SF/F culture, along with a Parsec Award-winning monthly podcast featuring a story, poem, and interview from that issue. 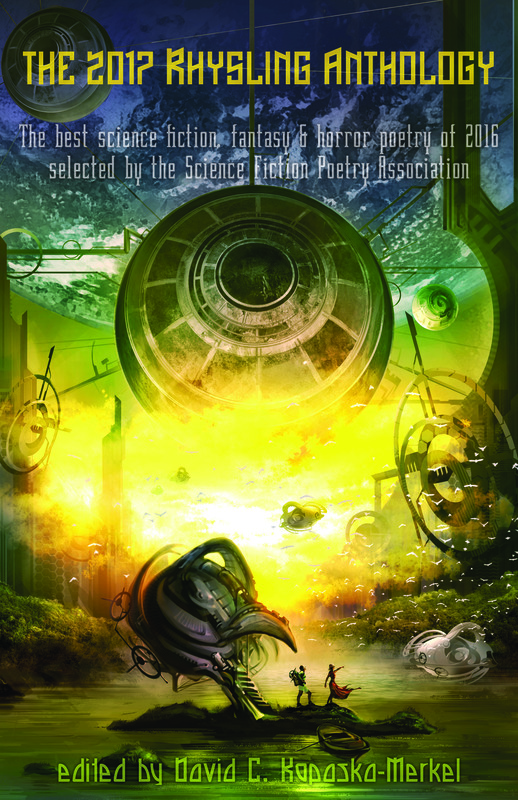 Stories from Uncanny Magazine have been finalists or winners of the Hugo, Nebula, Locus, and World Fantasy Awards. The entire contents can be purchased in the eBook version on the day of release from Weightless Books, Amazon, Barnes & Noble, Google Play, and Kobo. Uncanny’s free online content will be released in two stages, half on March 7 and half on April 4. EBook subscriptions are available from Weightless Books and Amazon. They also take support on Patreon. For more information, please check out uncannymagazine.com or follow Uncanny at https://twitter.com/UncannyMagazine or https://www.facebook.com/uncannymagazine. Pixel Scroll 2/27/17 That’s it! Scroll Over Man, Scroll Over! (1) ACADEMY INVITES LE GUIN. Ursula K. LeGuin has been voted into the American Academy of Arts and Letters reports SFGate. The 87-year-old Le Guin is one of 14 new core members of the Academy. The arts academy, an honorary society with a core membership of 250 writers, artists, composers and architects, once shunned “genre” writers such as Le Guin. Even such giants as science fiction writer Ray Bradbury and crime novelist Elmore Leonard never got in. Academy member Michael Chabon, the Pulitzer Prize-winning novelist, advocated for Le Guin. (2) 2017 RHYSLING ANTHOLOGY COVER REVEAL. Hat tip to F.J. Bergmann. (3) NEW FICTION WEBZINE. Science fiction and fantasy book imprint Strange Fictions Press will officially launch Strange Fictions SciFi & Fantasy Zine on February 28 with “This Chicken Outfit,” by Pushcart nominated author, A.L. Sirois. Siriois’ short stories have appeared in Thema, Amazing Stories, and Isaac Asimov’s Science Fiction Magazine. He has also contributed comic art for DC, Marvel, and Charlton. Strange Fictions will focus “on publishing speculative short fiction, nonfiction, art, and poetry twice a week for genre fans worldwide.” New stories, poems, and essays will appear every Tuesday and Friday. Subscribers can sign up for email notifications whenever a new story is posted. Strange Fictions SF&F Zine is open to submissions from both new and experienced genre writers, and details can be found at the website. 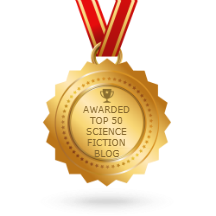 Authors of acquired pieces for Strange Fictions SF&F ‘Zine will receive a flat fee payment of $5 for stories, essays, poetry, and book reviews of 4,999 words and under and $10 for stories, essays, poetry, and book reviews of 5,000-10,000. (5) DEFYING THE LAW…OF GRAVITY. In “Mars Needs Lawyers” on FiveThirtyEight, Maggie Koerth-Baker looks at the many problems of international law that have to be solved in we’re ever going to have successful Mars missions. For example: if you have astronauts from five countries flying in a spacecraft that’s registered in Liberia, how do you figure out which country’s law applies? For instance, a limited number of satellites can orbit the Earth simultaneously. Put up too many, and you end up with an expensive game of celestial bumper cars. But some countries — Russia and the United States, in particular — had a big head start on gobbling up those slots. What do you do if you’re Nigeria? Today, Gabrynowicz said, the international community has settled on a regulatory system that attempts to balance the needs of nations that can put an object into geostationary orbit first with the needs of those that aren’t there yet but could be later. And even this compromise is still extremely controversial. The same basic disagreement behind them will apply to Mars, too. And it’s at issue right now in the U.S., as lawmakers try to figure out how best to implement the U.S. Commercial Space Launch Competitiveness Act — a bill signed by President Obama in November 2015. That law states that U.S. companies can own and sell space resources — including minerals and water. But the details of what this means in practice haven’t been worked out yet, Gabrynowicz said. Legal experts say that those details will make the difference in terms of whether the law puts the U.S. in violation of the Outer Space Treaty. This question of whether space should be an Old West-style gold rush or an equitably distributed public commons could have been settled decades ago, with the 1979 Moon Agreement (aka the Agreement Governing the Activities of States on the Moon and Other Celestial Bodies), which would have established space as part of the “common heritage of mankind.” What this would have meant in practice is not totally clear. But at the time, opponents saw it as having the potential to ban all private enterprise and effectively turn the heavens into a United Nations dictatorship. It ended up being signed by a handful of countries, most of which have no space program. But it is international law, and if humans go to Mars, though, we’ll likely end up debating this issue again. (6) GAME WRITING. Monica Valentinelli gives an “Overview of Game Production and the Role of Writers” at the SFWA Blog. One of the things I enjoy doing as a game developer is hiring new writers. In almost every case, writers are shocked to learn how many levers and pulleys there are in game production. This tends to hold true regardless of what kind of game a writer is contributing to; in part, this has to do with the process of transitioning from a consumer’s mindset (e.g. fan, critic, reviewer) to that of a creator’s. Sometimes, however, the process is confusing because there are aspects physical development that writers aren’t always involved with. A good example of this is that developers often regard word processing documents with an eye for production when they redline and provide comments. What’s laid out vertically on a page in text isn’t how it will be rendered in the final product, and that has a huge impact on what the writers are hired to write, edit, and make changes on. Sometimes, the number of words that fit on a page or a screen can also shape a writer’s assignment, too. (7) DISNEY’S DUDEFRÉRES. Another clip from the live-action Beauty and the Beast shows LeFou singing “My, what a guy, that Gaston!” With Luke Evans as Gaston and Josh Gad as LeFou. (8) VOIR DIRE STRAITS. Shadow Clarke juror Jonathan McCalmont followed his introductory post with an entry on his ownblog, Ruthless Culture “Genre Origin Stories”. Firstly, I think it does a pretty good job of capturing how I currently feel about the institutions of genre culture. To be blunt, I don’t think that genre fandom survived the culture wars of 2015 and I think genre culture has now entered a post-apocalyptic phase in which a few institutional citadels manage to keep the lights on while the rest of the field is little more than a blasted wasteland full of isolated, lonely people. One reason why I agreed to get involved with shadowing the Clarke Award is that I see the Shadow Clarke as an opportunity to build something new that re-introduces the idea that engaging with literary science fiction can be about more than denouncing your former friends and providing under-supported writers with free PR…. McCalmont’s post includes a high overview of the past 40 years of fanhistory. I was surprised to find many points of agreement, such as his takes about things that frustrated me at the time they were happening, or that I witnessed affecting my friends among the LA locals who founded anime fandom. Regardless of whether they are conventional, idiosyncratic, or simply products of distracted parenting, our paths into science fiction cannot help but shape our understanding and expectations of the field. Unfortunately, where there is difference there is bound to be misunderstanding and where there is misunderstanding there must inevitably be conflict. The problem is that while the walls of science fiction may be infinitely porous and allow for inspiration from different cultures and artistic forms, the cultural institutions surrounding science fiction have shown themselves to be remarkably inflexible when it comes to making allowances for other people’s genre origin stories. The roots of the problem are as old as genre fandom itself. In fact, the very first Worldcon saw the members of one science fiction club deny entry to the membership of another on the grounds that the interlopers were socialists whose politicised understanding of speculative fiction posed an existential threat to the genre’s continued existence. A similar conflict erupted when the unexpected success of Star Wars turned a niche literary genre into a mass market phenomenon. Faced with the prospect of making allowances for legions of new fans with radically different ideas as to what constituted good science fiction, the institutions of genre fandom responded with sluggishness indistinguishable from hostility. Media fandom was born when traditional fandom refused to expand its horizons and the same thing happened again in the early 1990s when fans of anime decided that it was better to build their own institutions than to fight street-by-street for the right to be hidden away in the smallest and hottest rooms that science fiction conventions had to offer. The institutions of genre culture may pride themselves on their inclusiveness and forward-thinking but this is largely a product of the excluded not sticking around long enough to give their own sides of the story. Time and again, the institutions of genre culture have been offered the chance to get in on the ground floor when science-fictional ideas began to manifest themselves in different ways. Time and again, the institutions of genre culture have chosen to protect the primacy of the familiar over the vibrancy of the new and the different…. Cultural commentators may choose to characterise 2015 as the year in which genre culture rejected the misogynistic white supremacy of the American right but the real message is far more nuanced. Though the institutions of genre culture have undoubtedly improved when it comes to reflecting the diversity not only of the field but also of society at large, this movement towards ethnic and sexual diversity has coincided with a broader movement of aesthetic conservatism as voices young and old find themselves corralled into a narrowing range of hyper-commercial forms. I thought that was well said. Unfortunately, I also read the comments. (10) THE STRAIGHT POOP. “Do Cats Cause Schizophrenia? Believe the Science, Not the Hype” advises WIRED. The link between schizophrenia and cats goes back to the 1970s, when psychiatrist E. Fuller Torrey learned that viruses from dogs might trigger multiple sclerosis—a neurological condition—in humans. “That got me thinking about which animals host which infectious agents,” he says. Soon, he learned that cats host the most successful infectious bacteria in the world: Toxoplasma gondii. Looking into previously published research, he found plenty of studies showing that schizophrenics often had higher levels of toxoplasma antibodies in their blood than people without the mental illness. Then he started surveying schizophrenics about their life history, and found that many had indeed lived with cats. But what’s important isn’t just if, it’s when. See, Torrey’s theory isn’t merely that T. gondii causes mental illness, it’s that it somehow alters the development of a person’s brain during crucial periods of brain development—and probably only if that person is genetically predisposed to schizophrenia. It’s a complicated hypothesis, and even after four decades of study, Torrey says he’s still not totally convinced it’s fact. Hence, his continued research on the subject. But that’s not what the study said. 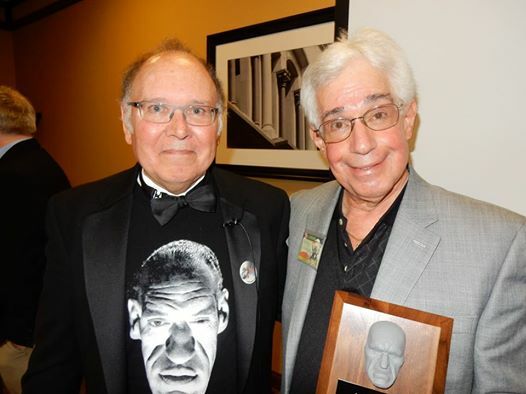 By Steve Vertlieb: David Colton has announced the nominations for this year’s slate of recipients for the prestigious Rondo Awards, honoring the very best in “fantastic” creativity, comprising imaginative cinema, television, books, magazines, and art. I shall always remember with both pride and honor the very special moment less than a year ago when, on Saturday evening, June 4th, 2016, I was awarded Rondo’s highest honor…the Rondo “Hall of Fame” in recognition of a lifetime of journalism and publishing. That wondrous evening will always stand out as, perhaps, the most memorable night of my own seventy-one years. With that thought in mind, I’d like to take a moment to wish all of this year’s worthy nominees the same fortune and good luck that made my own special night so memorable in 2016. Wishing each of this year’s worthy nominees God speed and sublime recognition of your work and inspiration. Online voting has begun for the 15th Annual Rondo Hatton Classic Horror Awards. You’re invited to vote for your favorites in any or all 29 categories. Click the link for instructions and the complete ballot. The deadline to participate is midnight April 16. As teaser, here are the Best Movie and Best Television Presentation finalists. THE WALKING DEAD, ‘The Day Will Come When You Won’t Be,” 10.23.16 AMC. Nagen’s brutality shakes up survivors and viewers. ‘Not today. Not tomorrow. But I am gonna kill you. WESTWORLD, ‘The Bicameral Mind,’ 12.4.16, HBO. Robert the park designer reveals his secret as one Host tries to leave. ‘How can you learn from your mistakes if you can’t remember them? On March 10, witness the rise of the King. By Carl Slaughter: On July 29, 1952, the Pentagon held a press conference about flying saucers. The flying saucer phenomenon began on June 24, 1947, after Kenneth Arnold reported to his airport tower sighting nine saucer-shaped vessels flying at extremely fast speed in echelon formation over the mountains of Washington state. When Arnold landed, the local media was waiting for him. The wire services picked up the story. Within 24 hours, newspapers all over the country ran front page headlines about the Arnold report. Suddenly more and more people claimed flying saucer sightings. UFOs had entered American culture. On January 7, 1948, Kentucky Air National Guard pilot Captain Thomas Mantell crashed and died while in pursuit of a UFO. The public and the military began to take flying saucer sightings much more seriously because Mantell’s death indicated a possible alien hostile presence on Earth. (Another concern was that the vessels might be Soviet. This was at the beginning of the Cold War.) On October 1, 1948, North Dakota Air National Guard second lieutenant George Gorman engaged in an extended chase with a UFO that had speed and maneuverability far beyond any human vessel at the time. In response to these and other UFO encounters, the Pentagon launched Project Bluebook and other investigation projects. The CIA launched the Robertson Panel and Congress launched the Condon Committee. Project Bluebook was finally shut down in 1970. Whether or not you believe in UFOs, this documentary is an excellent history of the UFO phenomenon.